With the year end almost here many of the popular online learning resources are sharing their top courses from 2015. No huge surprise but once again, Python programming courses cracked the Top 10 with popular E-Learning resource Coursera. Are you ambassador material? Have you got game and are you passionate about teaching others? Geospatial professionals, educators & students encouraged to help youth develop problem-solving skills using technology. Esri Canada connects GIS Ambassadors with schools in their community and provides a wealth of teaching resources including lesson plans, tutorials and activities for students. 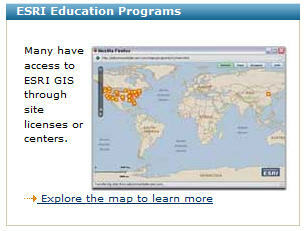 Interested participants may contact the Education and Research group at k12@esri.ca. An interesting MOOC from Esri with a focus on Location analytics starts soon. This from Esri… The Location Advantage is a free, instructor-led massive open online course (MOOC) that will be offered by Esri for the first time on May 12th in 2015 and lasts 6 weeks. An impressive effort here, Map of the growth of Colleges in America. In order to create the product, I’m told by creator, Mike Summons, that he manually searched for each college’s founding date and latitude/longitude, finishing with a list of 2,068 schools! About the Project… eCollegeFinder is back with new map, this time it’s in motion! From the creators… Late in 2014, we stumbled across Flowing Data’s map showing “The Growth of Walmart”, which Excel Hero recreated using a simple Excel workbook. We found the map to be mesmerizing and immensely informative, telling the story of Walmart in such a simple fashion. So much so, that we decided to recreate a similar map of our own, this time looking at “The Growth of Colleges in America”.